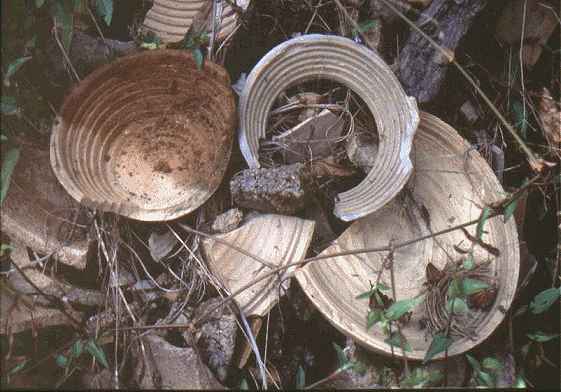 Song Dynasty stepped setters as found on the ground in the Hutien village just outside of Jingdezhen in 1992. The steps on the inside is for upside-down (fushao) firing of Qingbai bowls and dishes with unglazed rim. These setters was probably fired together with the bowls inside larger pot shaped saggars. "The porcelain while being fired in the furnace must be kept perfectly clean: a single spot of dirt makes a colored stain. Moreover, the blast of air and fierce flames of the furnace would injure the delicate paste. For these reasons it is necessary to place the porcelain inside saggars. The clay used in making these cases comes from the village of Li-ch'un, which is on the northeast of Jingdezhen. It is of three different colors - black, red and white. A kind of blackish yellow sand, which is found at Pao-shih-san, is mixed with the clay to form a paste, so that it may be more readily fired. The cases are fashioned on a wheel, which is similar to the wheel used for porcelain. The paste need not be finely levigated. After the cases have been partially dried they are roughly finished off with a knife, put into the furnace, and fired for the first time empty. When baked and ready for use, they are called by the name of tu-hsia, or 'finished cases'. The workmen who manufacture the saggars are used to - with the same coarse paste - to make, on the same wheel, a supply of earthenware bowls for the daily use of the potters in their native hamlets."